The latest Paperback Paradise casts a spotlight on hard-boiled detective and crime fiction of the thirties, forties, and fifties and features work by some of the most accomplished authors in the genre. Plus, those painted covers! Heath is joined by James, aka the Comic Book Savant, to discuss the great debate: theater versus home theater! With movie ticket prices going up and home video prices going down, this is more topical than ever! How do you decide whether to support a movie at the theater or wait until it comes to Blu-ray, DVD, digital, or streaming? There's a lot to say about the movie Gun Crazy. Entire books have been written about it. Furthermore, it's frequently taught in film classes, and the movie holds a place on multiple cinematic achievement lists. 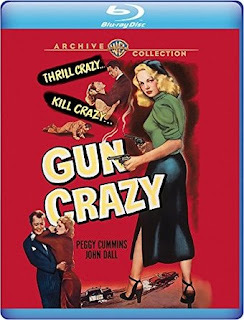 I've known and loved Gun Crazy for years, first "meeting" it via the "Film Noir Classic Collection Volume 1," released by Warner Brothers in 2006. Now the landmark movie has been restored and is available on Blu-ray courtesy of Warner Archive, and revisiting it has been an absolute pleasure. I believe this to be the definitive home video version of Gun Crazy. It's Wrestlemania time! With the grandest stage of them all now just days away, yours truly debates on whether to see it or skip it. We go through the build up and the momentum (or lack of momentum) of certain feuds and storylines, Becky Lynch versus Ronda Rousey, and even talk about the direct assault on Vince McMahon and the WWE corporation from late night host John Oliver!